Years ago, my Uncle gave me the book Deep Economy: The Wealth of Communities and the Durable Future by Bill McKibben for Christmas. My Uncle had heard him talk and thought that I would be interested in the book and economics and ecological ideas it contained. Grad school precludes reading anything for fun so I have lots of books that I have been meaning to read and hence, I finally got around to reading this book. And I loved it. This is a great book filled with great, big ideas that get you thinking. McKibben writes about our relationship, as humans, with each other, our communities, and our planet and how that relationship works in economic terms. He fills the book with rich examples and stories about a year of eating only locally grown food, radio stations and how they represent our community, that our American way of life is absolutely unsustainable to the planet if we exported it to countries like China and India, and offers ideas as to how we can live and grow our economy in a durable and sustainable way, both for our communities and for our planet. The book was written in 2007 and is an interesting discussion to have knowing that the following year the boom would finally bust and we would fall into the Great Recession. McKibben makes the reader think about the local and global ecological and economic impact of our decisions to consume large quantities of oil for food, to buy larger houses and commute farther, to become so immersed in satellite radio, television and internet that we forget the local community we live in, the shipment of food around the world, the growth of third and second world economies and what the world will look like if they all follow the American growth model. 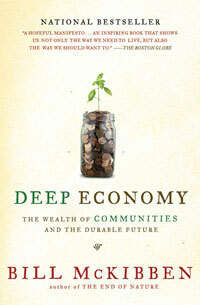 The book asks deep questions like: What should development look like?, Is continuous growth realistic or sustainable? Should the whole world strive to live like Americans? Does prosperity insulate us from relying on our communities? I encourage everyone to read this book and expand your mind while pondering these deep questions. This is a great read for anyone interested in economics and ecology and shows the deep intertwined relationship between the two. It made me think harder about the economic and ecological choices that I make, why I make them, and what impact they have on my community and planet. Hopefully it will make you think too. Do you love to read and write? Grammarly offers an instant grammar and plagiarism check because copycats aren’t nearly as cool as real cats (or dogs), plus they can get kicked out of school, get disapproving looks from Mom, and learn how to ask if you want fries with that. Everyone likes fries but not everyone wants to sell them. Think about it. Grammar is important. Check out Grammarly next time you write a paper or review. It’s free and awesome (like cats, and dogs, and fries).